Identifies the Sea of Japan. 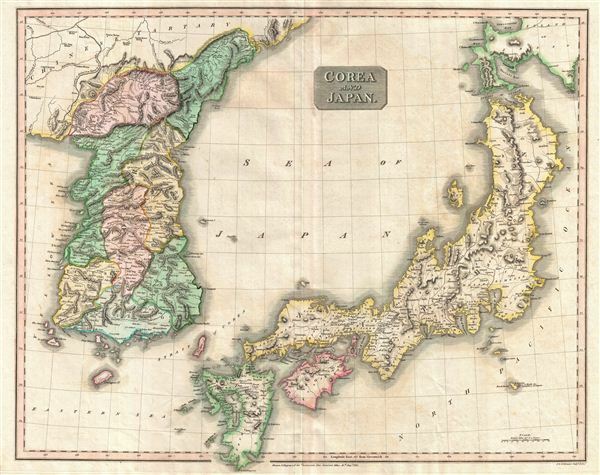 This fascinating hand colored 1814 map depicts Korea and Japan. Both Korea and Japan are divided according to their constituent provinces with Hokkaido, identified as Jesso (Yesso), partially off the map. The island of Hachijo (incorrectly identified here as Fatsisio), just south of Edo Bay, is identified as a 'Place of Exile for the Grandees of Japan.' Though the Izu Islands were in fact used as convict settlements in the 18th century, Hachijo Island was not particular in that respect, nor was the social status of its criminals. A wall of wooden spikes dividing Chinese Tartary (today's Manchuria) from Korea is also noted. The sea between Japan and Korea, whose name, either the 'Sea of Korea' or the 'Sea of Japan,' is currently a matter of historical and political dispute between the two countries, is here identified in favor of Japan. The whole is beautifully engraved in the minimalist English style pioneered in the early part of the 19th century. Thomson maps are known for their stunning color, awe inspiring size, and magnificent detail. Thomson's work, including this map, represents some of the finest cartographic art of the 19th century. Relief is shown by hachure with towns, cities, and major topographical features identified. Engraved in 1814 by J. and G. Menzies and issued as Plate no. 34 for Edinburgh cartographer John Thomson's 1817 issue of the New General Atlas. Very good condition. Original centerfold. Some offsetting. Blank on verso. Original platemark visible. Rumsey 1007.041. Phillips (Atlases) 731. Newberry Library: Ayer 135 T4 1817.